Getting out of the Legacy Trap: Lotus Notes, Infopath, Access Services Apps. 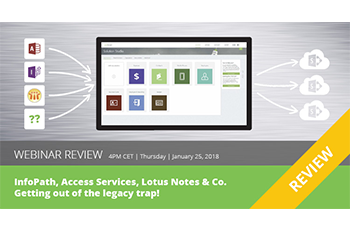 Getting out of the legacy trap: InfoPath, Access Services, Lotus Notes & Co.
How to replace Lotus Notes Apps with full functionality? How to replace Access Services Apps in just a few hours. We are witnessing that transition to cloud or even to newer versions of SharePoint Server for that matter is in far distance for many SharePoint installations, due to the legacy customization accumulated over the years. May it be custom InfoPath list forms or Form Libraries, Access Services apps, SharePoint Designer custom list forms and workflows, or plain simple custom development on top of SharePoint, they all are holding the companies back in the tech of 2000s. Additional to that, most of those tools are either fully deprecated (Access Services will stop working in April 2018! ), or, in best case, you’ve got some prolonged support. In case you missed the webinar we attached the recording down below. Furthermore you can find the questions and the corresponding answers below the video. Again, thanks everyone for attending, and see you in the next webinar! Is it possible to customize solutions created in skybow Solution Studio without the Studio itself? No, skybow Solution Studio is a solution creating tool, and solutions created in skybow Solution Studio must be changed and customized with skybow Solution Studio, otherwise solutions can't be updated later on or they can (and probably will) break. skybow Solution Studio of course does not have to be present at the target site, where solution has to be deployed. Can the forms be used on mobile devices too? SharePoint itself in the classic experience is not mobile ready, so forms on top of SharePoint aren't mobile ready as well. For the moment, Microsoft does not support creating and customizing forms for modern lists and libraries, which are mobile ready. In that moment when Microsoft supports this, we will be happy to include it in skybow Solution Studio. What do you think about using skybow Solution Studio instead of Lightning Forms as an InfoPath replacement? skybow Solution Studio offers way more features besides forms creation and management - such as background calculations, scheduled actions (timer jobs) and generating reports, as well as full ALM support through packaging and publishing process. For the UI tasks only (form design, validation and calculation, buttons with actions), Lightning Forms are very good and suggested solution. What are the costs of skybow Solution Studio? skybow Solution Studio is free for developers - it has to be paid for solution usage. There are two models for that, one is the subscription model (per user, per solution), and the other one is an enterprise model, where skybow Solution Studio is being used as a platform. Please contact skybow Sales at sales@skybow.com for more details. Can workflows created in Flow be migrated? No, unfortunatelly they cannot. They can be shared with the colleagues.